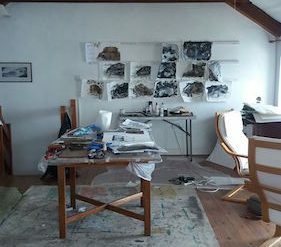 Whilst I had set an idea for my residency when I first applied in 2016…life had taken a number of turns before I could attend Brisons, as such my ideas had broadened. In retrospect I am really glad they had as I feel my experience was much deeper and more profound as a result. 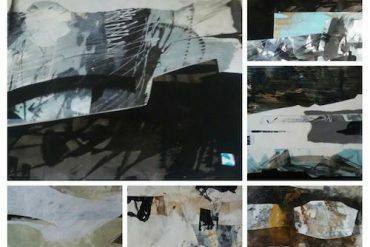 My work has dealt with the urban environment, industrial architecture, the effects of time and tide on the built environment, decay etc for a number of years. During the course of the last year I have experience a major shift in my life, and work. As a result I am painting more intuitively, planning and researching less (life is too short) and generally trusting the process. However I had identified two areas that I wanted to work on at Brisons, the first being mark-making…I had ‘lost’ the joy of simply making marks, and the second was to resist the temptation to make finished pieces, by that I mean leave the audience at home and just focus on responding to what for me, as a city girl, is a very new environment. 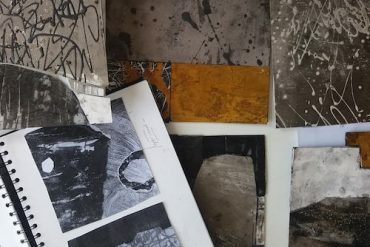 So, whilst I still focused on the industrial heritage of the area, and delighted in it, I also found new ways of working, explored a wide range of mark-making media and techniques, for the first time drew and painted in a rural environment, and developed an exciting approach of cutting and tearing my drawings and sketches to create compositional sketches in collage form. There were so many lessons learned and so much achieved that it’s hard to pin down. Overall an increased confidence to respond and play, to trust the process of gathering and creating, to make work for me – for the sheer joy and delight in it, to embrace a new environment and see what occurs. I logged my progress throughout the week with a diary and photographs. I was particularly drawn to the geology of the area…the origins of the industry. My studies of the geology are already providing a wealth of resources for my prints. I’m intrigued by concepts surrounding bringing together both micro and macro scale, aerial maps and different viewpoints simultaneously. A week wasn’t long enough!